Once two or more of your team members make it inside the shelter, send out a reconnaissance pair to grab a box of supplies. One box is plenty and it doesn’t matter who grabs it. But the monster spots you once you do - so you gotta be fast! The shelter holds a max of 7 and it takes 4 from the same team to pull the door closed. Do what you must to survive. If you’re standing outside, knock down an opponent and make them scramble to their feet again. If you’re in the shelter, shove them out and make room for your team. But wait! It might not be over if you spot a manhole cover. Grab it and knock the monster down or use it to pry open the fallout shelter. If you grab the cover before you secure the box of supplies, the nefarious monster will surely notice you. 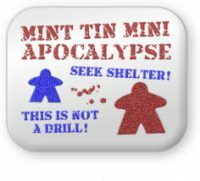 Add a Review for "Mint Tin Mini Apocalypse"